Your daily Tarot card for today Monday, April 22nd 2019 is King of Cups. Today you will get in contact with an emotional man who will help you with your problem. A soulful and medial man will be be important for your relationship. He will help you to end the disputes with your partner and he will give you new perspectives. If you are a woman, this Tarot card can also stand for your beloved and spiritual husband. If you have no partner, today you will meet a soulful and spiritual man. 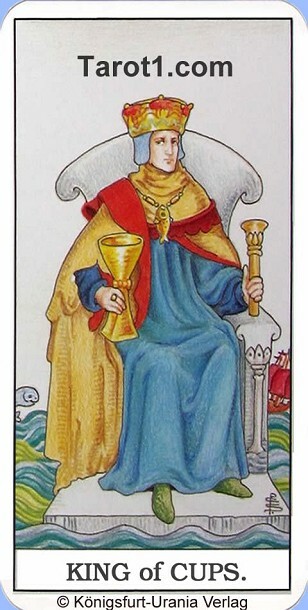 The King of Cups is sitting on his throne, which is directly in the water on a small platform. The throne is completely surrounded by water and the king is looking with a soulful face to the viewer of the Tarot card. The water around the king represents the world of emotions. The king himself is balanced and soulful, what is standing for our emotional life.